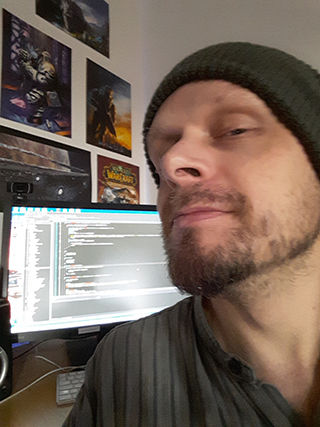 I have been self-employed since April of 2008, and have done consultancy work for game industry clients such as (the now defunct) Jungle Peak Studios and StarVault, as well as audio-design work and software coaching for Pet Factory. I have lectured several times on the topics of game design and programming at both the Kalmar University and School of Future Entertainment in Karlshamn. During the autumn of 2008 I held courses in both network / multiplayer programming and agile development technologies at GameMaker in Arvika, Sweden. I also developed Java based web games for Jungle Peak Studios during that period, as well as visual effects plugins for FilmGate. 2009 saw development of tools for Resolution Interactive (now Level Eight)'s iPhone games, as well as design and implementation work on StarVault's deployment software for Mortal Online. 2009 also saw my continued involvement in Spell of Play Studios, furthering development on collaborative and personal game projects, as well as doing audio and music production (among other things the song Bärs é Livet, available on Spotify and iTunes). Some work was also done on a book in the field of software engineering / game development.